Septimia Zenobia was queen of the Syria-based Palmyrene Empire. She was born to a noble Palmyrene family and married the ruler of the city, Odaenathus. After Odaenathus' assassination, Zenobia became the regent of her son Vaballathus and held de facto power throughout his reign. In 270, Zenobia launched an invasion which brought most of the Roman East under her sway and culminated with the annexation of Egypt. 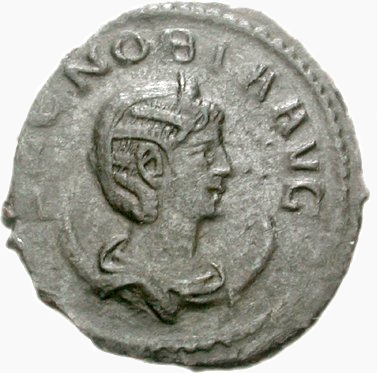 She remained nominally subordinate to Rome, but in reaction to Aurelian's campaign in 272, Zenobia declared her son emperor and assumed the title of empress (declaring Palmyra's secession from Rome). The Romans were victorious after heavy fighting; the queen was besieged in her capital and captured by Aurelian, who exiled her to Rome where she spent the remainder of her life.